2019 FOX NZ Motocross Championship kicked off at Taranaki Motorcycle club track, February 3rd, 3 race format with MX1, MX2, 125cc and MX3 rounding out Race Schedule – home track of NZ’s first, and KTM Factory first FIM World Motocross Champion Shayne King. Togther with brother Darryll King, the duo carved NZ’s mark in World MX Championship history, paving the way for fellow NZ riders to etch out professional careers. Most notably, it was Josh Coppins and Ben Townley who shone the torch for Kiwi’s racing, beating, and holding the coveted FIM World MX Championship trophy- BT taking MX2 Title in 2004 and JC finishing Vice-World MX Champion 2x: 2002 and 2005. 2006 NZ’s only Women MX racer, lined-up against Europe’s best WMX field. Katherine Prumm (now Oberlin-Brown) fought for her goal of becoming NZ’s first Women MX Champion, holding off stiff competition winning consecutive WMX Titles in 2006 and 2007. All NZ’s FIM World MX Champions raced grass-roots Motocross- club, regional and National level. 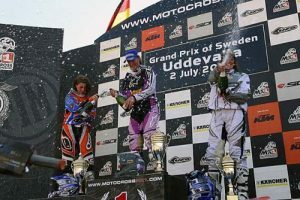 Katherine, raced against the guys in MX2, stating this was main reason for being well prepared- physically, mentally and technically- to compete in Europe. 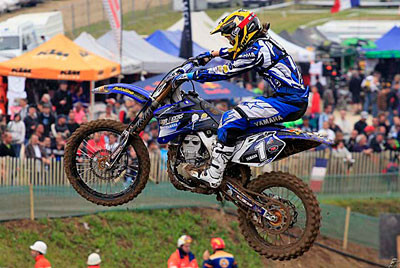 Even as far to say: ‘I knew I wasn’t as fast as the MX2 guys, but I could out-smart many during racing’. Move on to 2015, NZ’s Josiah Natzke raced NZ MX Nationals in preparation for EMX 125cc season under at the time KTM Junior Team Manager Stefan Everts. 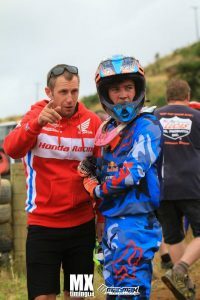 Ben Townley was instrumental in guiding Josiah to be ‘Ready to Race’ come opening Round in Trentino 1 month post NZ MX Nationals. Josiah finished 5th Overall in Opening Round. 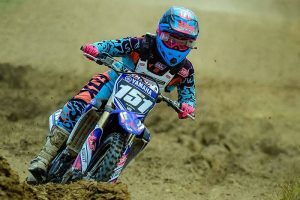 For Women Motocross World Champion racer Courtney Duncan, NZ’s only GP at Woodville 2016 tested # 151 capabilities when Courtney raced MX2 agianst all male field. No-one would forget the dominance Courtney displayed winning, beating and standing top of podium with NZ’s EMX 2015 2nd Overall rider Josiah Natzke 2nd step down. 2 months later Courtney came out pumping, winning her debut Women Motocross World Championship Round in Qatar, going 1-1 for whole world to see. Not only are NZ Motocross Championship events key for providing riders stepping stone, pathway to advance their career to race overseas, National MX Championships are the pinnacle of the sport in NZ- to be heralded as such by mainstream public. No other sport in NZ can boast age range from 125cc class, through to MX2 and premier MX1 class at National Championship event. No other sport can promote young riders, celebrating racing on National track, with YZ 65cc Cup, and for SX- KTM SX Challange: 65cc. No other sport has the provision of pitting Women Motorsport riders against male field- with intention of Women upping their skills along with gaining experience to race overseas. For Riders, NZ’s Motocross Championship events are worthy to compete in, not just for racing but for advancement in their chosen sport. For industry, National Championships are the pinnacle showcase of product. For public, all above are to be seen- because if you are not seen, no-one will know what the sport is all about.